Soviet Union left wing SERGEI KAPUSTIN (8), the 1982 draft choice of the New York Rangers who scored six goals in as many contests at the 1976 Winter Games and registered 66 goals in a dozen appearances at major international tournaments for the U.S.S.R., and his former Spartak Moscow linemate Viktor Shalimov both returned to the same city in the Alps in which they won an Olympic gold medal a decade later when the aging pair each switched to EV Innsbruck of the Austrian Bundesliga. 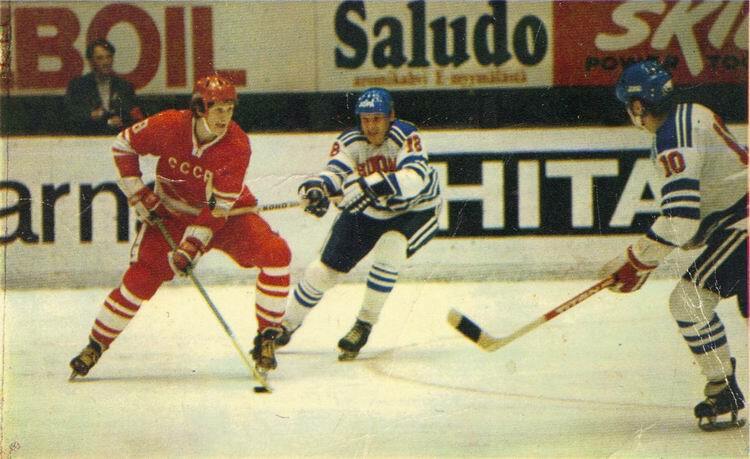 After a three-year moratorium, the Soviet Union once again, at the outset of the 1979/80 campaign, began the low-key transfer of a very limited number of select players to ice hockey clubs in the carefully chosen countries of Austria, Finland and Japan. With the second wave of the so-called Cultural Exchange program, however, the Soviet ice hockey authorities started sending more of the nation’s top shelf, international star skaters abroad. 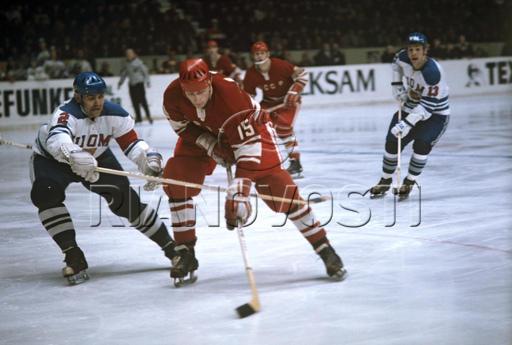 Both YURI LIAPKIN and his Spartak Moscow teammate VLADIMIR SHADRIN, the top goal-getter at the 1976 Winter Olympics, had been integral members of the U.S.S.R.’s gold medal squad at the Innsbruck Games. Three other players from the team that won the Olympic title for the Soviet Union a record-tying fourth consecutive time were also later rewarded with the opportunity to play at Innsbruck’s Olympiahalle again via a season or so in the Austrian Bundesliga. It is interesting to note that, by now, the U.S.S.R. had expanded the scope of their cultural exchanges to include West Germany. The Soviets had always been willing to allow re-unification so long as the West Germans de-camp the North American Treaty Organization and the new Deutschland join the Warsaw Pact immediately. In the meantime, 35-year-old veteran Torpedo Gorky winger ALEXEI MISHIN broke new ground with his transfer to 2.Bundesliga outfit EHC Hamburg. 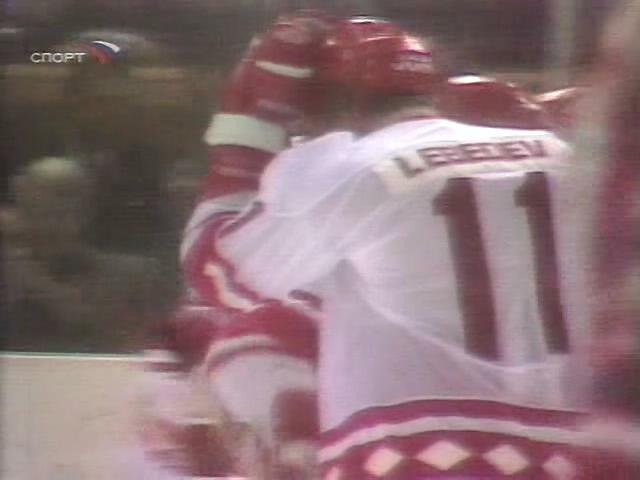 Long-time Soviet Wings forward YURI LEBEDEV (11) totaled 10 goals and 26 points in 47 games over the course of his eight appearances for the Soviet Union national team at major international tournaments in his career. The Moscow native who began his career with the famous army club CSKA did not make the Soviet squad for the 1976 Winter Olympics despite having been on the U.S.S.R. teams which had won the title at the last three prior IIHF World Championships. Lebedev, who would go on to appear at Lake Placid, missed out on the gold medal at the Innsbruck Games after being left behind by his club coach in the domestic league, Boris Kulagin. On the heels of three Soviet leaders passing away in as many years, the reform-minded MIKHAIL GORBACHEV became Communist Party General Secretary upon election by the Politburo in March of 1985, just a short time before Czechoslovakia stopped the U.S.S.R.’s streak of five consecutive titles won at the IIHF World Championships. Gorbachev’s new policy of “Perestroika”, announced at the Party Congress in the spring of 1986, would have a dramatic impact on all aspects of life in the Soviet Union, ice hockey notwithstanding, soon enough. By the end of the decade, the trickle of talent heading West had evolved into an outright flood. Soviet Union left wing ALEXANDER YAKUSHEV (15) of Spartak Moscow, who racked up 64 goals over the course of twelve appearances for the U.S.S.R. at major international tournaments in his career, netted a pivotal goal for the Soviets in the de facto Gold Medal Match against Czechoslovakia on the final day of the ice hockey programme at the 1976 Winter Olympic Games hosted by Innsbruck, Austria.